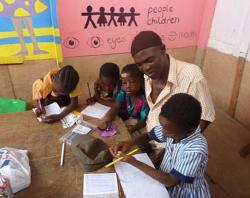 Projects Abroad volunteers in Ghana are now working with the Future Leaders Underprivileged Children’s Center in Accra. This school now teaches more than 80 children, however, it started with just 5 children being taught in the shade of a mango tree. ‘Throughout the diverse cultures I’ve had the chance to see there is certainly an immense diversity in motivations for people. In the case of Mamud Billa, motivation meets him and reaches others on its way. Starting his mission under a mango tree back in 1998, he has been teaching children whom circumstances do not allow them to join school. His school started with just 5 kids. ‘Covered by the shelter of the mango tree we used to learn together. Under the fresh shade of the tree they learned the numbers’ Mamud mentions. The second period of the school, or better known as the ‘second mango tree period’ got much more kids. Mamud Billa was then teaching to about 80 kids! Now the school has been officially established. ‘Future Leaders Underprivileged Children Center’ (UCC). Mamud Billa goes out on a search for kids in hard situations and he invites them to join the school enabling them to have the basics of education. He also works encouraging the parents to send their children to school. This way he has been able to send almost 115 kids to higher education level schools! This is what we can call a great passion and a life-changing experience. As the number of kids grows, he needs more help from volunteers who want to teach one-to-one. Through the help of others he strengthens his school and the education of the kids. 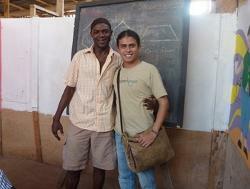 Projects Abroad joins his cause and volunteers are teaching in the school. We are happy to know that there is a great contribution made by the volunteers! Congratulations to a man dedicating his life to the improvement of others’.